Not only does Dave Dombrowski lust after (soon-to-be) 40-year old Carlos Beltran—three other GMs do as well! According to WEEI.com's Rob Bradford, The Evil Ones, Astros, and Blue Jays also have their sights set on the 1999 Rookie Of The Year. 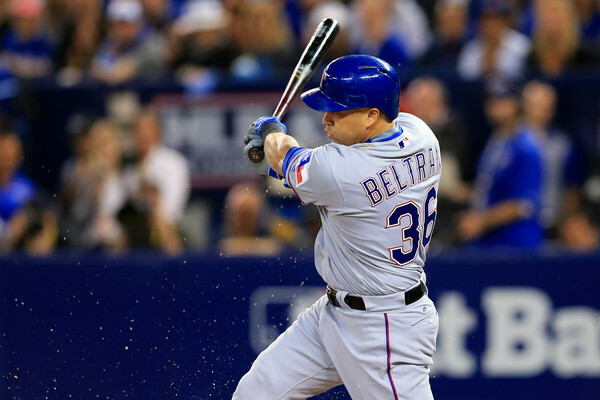 In his nearly two decades of play, Beltran has compiled some impressive numbers: 421 HRs, .281 BA, .354 OBP, .492 SLG. And, last season, he hit .295 with 29 HRs in 151 games for both Texas and The Bronx Embalmers. Still, do we really want to supplant one 40-year old slugger with another? Stay tuned!